There are many ways to perform myocardial perfusion imaging. Nuclear stress testing using SPECT is the standard in the United States, but PET, CT, MR, and ultrasound have developed their supporters for assessing blood flow to the heart. What’s the best noninvasive way to image blood flow to the heart and assess the need for medical intervention to prevent heart attacks? Most radiologists and cardiologists likely would answer nuclear imaging during both stress and rest. Inject a radioactive nuclear tracer when a patient is at rest and when exercising, then watch with a gamma camera as the heart muscle takes up the tracer. No uptake? That likely indicates a blockage (or partial blockage) in the coronary arteries that could lead to a heart attack. Nuclear stress testing (SPECT) has been around for more than 30 years “and is very well established in clinical practice” for assessing patients’ heart attack potential, says Ricardo C. Cury, MD, a noninvasive cardiovascular radiologist and the chairman and CEO of Radiology Associates of South Florida in Miami, a multispecialty group of 67 physicians. While most sites offer SPECT for MPI, more recently some also offer PET. Cury says PET’s advantage is that it adds diagnostic accuracy to the interpretation. With PET, physicians can numerically calculate myocardial blood flow. “SPECT is the visual assessment of uptake of radiotracer into the myocardium. It makes the reader’s interpretation subjective, whether it’s positive or negative. With PET, you have additional quantification of data that adds to the subjective interpretation of the physician.” PET also requires a slightly smaller radiation dose than SPECT performed with sodium iodide cameras—approximately 5 mSv. However, PET is more expensive and not as widely available as SPECT for MPI, Cury says. Interventionalists’ history and experience with SPECT prevents other modalities from gaining traction when it comes to performing MPI, but that is changing. MR for cardiac perfusion imaging emerged about 20 years ago and cardiac CT perfusion about five years ago. Both MRI and CT for MPI have their advocates. Trained in noninvasive diagnostic cardiovascular radiology, Brian Ghoshhajra, MD, director of clinical cardiac CT and MRI imaging at Massachusetts General Hospital in Boston, believes cardiac MR and CT are “better mousetraps” for perfusion imaging, with some caveats. But the status quo is keeping those modalities from making significant gains, he adds. For Robert W. Biederman, MD, a cardiologist and the director of the cardiovascular MRI center at the West Penn Allegheny Health System in Pittsburgh, there’s no choice when a patient needs MPI: “It’s MRI, and I can’t think of someone I sent for a nuclear study in well over 10 years.” But he also acknowledges that “it takes time to move practice” and expects his center will be one of few doing MPI with MR for sometime. Schwartz says his center has reported good- to excellent-quality images in patients who are obese or superobese (body mass index of 30 to 64) with CZT SPECT, which has set the stage for diagnostic evaluation compared with coronary angiography in this underserved and growing population. A huge advantage of SPECT and PET is that the nuclear tracers are not toxic to organ systems. “The radiotracers undergo decay and are predominantly eliminated from the gut; even patients with kidney or liver insufficiencies can safely undergo SPECT or PET,” Dorbala says. However, some physicians, including Cury, debate the diagnostic accuracy of nuclear stress testing. He says the diagnostic accuracy is approximately 80%, which means one in five patients will have either a false-positive or false-negative result. About one-half of patients who undergo nuclear stress testing cannot walk sufficiently on a treadmill to obtain a diagnostic test, but they can be given medications that create myocardial blood flow heterogeneity without the need for exercise stress. The objective diagnostic and prognostic value of vasodilator stress is well established, although the correlation with subjective exertional symptoms with ischemic heart disease (a decrease in blood supply) is unreliable, Schwartz says. “In terms of diagnostic accuracy, pharmacological stress is as good as exercise in diagnosing underlying coronary artery disease and identifying patients who are at risk of having future cardiovascular events,” Dorbala says. Pharmacological stress, particularly with PET imaging, allows for estimating myocardial blood flow, a more advanced technique to study the effects of coronary artery disease, she notes. One concern about nuclear stress testing is the amount of radiation exposure for patients. Cury says the average radiation exposure for SPECT is about 12 mSv, which is higher than most cardiac CT studies. However, Schwartz says newer techniques with both cardiac CT and SPECT and PET provide less radiation exposure. In addition, he says using stress-only testing reduces tracer dose by 60%, providing exposures as low as 1 to 3 mSv; is less costly and more efficient to perform in many patients; and has similar prognostic value to rest and stress imaging. The newer generation of high-speed molecular imaging cameras that use a new CTZ detector provide up to an order of magnitude increase in sensitivity. “Thanks to the increased sensitivity of the crystal, we can use image with a 10-fold reduction in dose or time of dose or combination of the two, enabling us to perform truly patient-centered imaging,” he says. Compared with SPECT, cardiac MRI is a validated test for myocardial perfusion, Ghoshhajra says. “MRI is a fairly new test in general and stress perfusions weren’t initially performed, so it’s a relatively new application of cardiac MRI.” Still, Ghoshhajra and Cury say MR has some advantages for perfusion imaging. Ghoshhajra and Cury say the superior spatial resolution of MRI is key. “Now we’re looking at 1- to 2-mm pixels vs. 7- to 10-mm pixels, and we can assign a wall thickness to these abnormalities,” Ghoshhajra says. He concedes that with MRI, patients often must hold their breath for at least 20 to 30 seconds. Also, he says it requires different expertise on the radiologists’ or cardiologists’ part to perform and interpret. And then there are artifacts. “MRI can cause an abnormality over the heart that can make a perfusion defect where there isn’t one. It could mimic a proximal left anterior descending coronary artery lesion—one you don’t want to miss nor overcall,” he says. However, recent studies of stress MRI show it has a significantly greater sensitivity than SPECT, according to Ghoshhajra. A single-center randomized trial of more than 750 patients in England published in 2011 in the Lancet showed that stress MRI had a sensitivity of 86.5% compared with nuclear SPECT, which was only 66.5%. Ghoshhajra says there are other issues with stress MRI: Most patients with pacemakers and implantable cardioverter defibrillators are not candidates for MRI, yet patients with known heart disease often need perfusion imaging. Patients with renal insufficiency aren’t candidates because the gadolinium-based contrast agents used for perfusion imaging are contraindicated in patients with kidney disease because of the risk of nephrogenic systemic fibrosis. Also, while a few researchers are experimenting with recumbent bicycle pedals that can be used with an MRI, for now stress MRI must be pharmacological. Biederman believes the limitations of cardiac perfusion MR slowly are being overcome. West Penn Allegheny Health has published studies that demonstrate the safety of cardiac MR in patients with pacemakers and implantable cardioverter defibrillators, as has a cardiac MRI center in California. “Even those seemingly verboten indications are being torn asunder,” Biederman says. Another theoretical advantage of MR is the lack of radiation, although the effects of intense magnetic fields on health outcomes have not been studied. Dorbala agrees that cardiac MRI offers higher spatial resolution than SPECT images; indeed, cardiac MRI is the current gold standard for estimating the extent of myocardial scarring. However, while cardiac MRI has been available for more than 10 years, she notes that it has not gained wide clinical application for perfusion imaging because of multiple technical challenges, patient contraindications, and the inability to use it with exercise stress. Cardiac CT myocardial perfusion is another noninvasive imaging option with great potential, according to Cury. Recent studies have validated stress CT myocardial perfusion against SPECT, cardiac MRI, invasive angiography, and fractional flow reserve with promising results. The combined evaluation of coronary CT angiography and myocardial CT perfusion in a single test is powerful, providing a comprehensive evaluation of stenosis detection and the presence of myocardial ischemia, Cury says. He emphasizes that the ability to evaluate coronary anatomy and myocardial physiology in a single setting with a radiation dose similar to SPECT is advantageous. He says stress perfusion CT has been rapidly validated, with recent multicenter trials being presented, and has a bright future, particularly with new payment models. Biederman agrees that CT is useful for identifying coronary arteries. 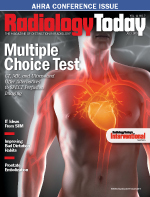 “Studies show CT has a resolution parallel to X-ray angiography from the cath lab, but its accuracy is approaching 90%. While work is being done, centers are looking at myocardial viability by CT, and there is some early encouraging data, but it’s a long way from being there,” he says. “The spatial resolution of CT is better than MR, but the temporal resolution is still relatively low. The ability at the present time doesn’t suggest CT is close to providing what MR can do.” Like SPECT, CT also raises questions about radiation exposure. Another alternative is ultrasound. Among ultrasound, CT, and MR, Biederman notes that ultrasound has been around the longest and is the least expensive but also is the least developed for myocardial perfusion. Dorbala says an issue with ultrasound is body size: “Body habitus is a problem if you’re too big or too small.” Patients need adequate openings between their ribs to provide sonographers with “good windows” to view the heart. Even if CT, MR, or ultrasound proved better than SPECT or PET for myocardial perfusion, radiologists and cardiologists agree it would take some time to change practice. Cost and experience play a role in which modality a physician recommends and is comfortable utilizing. Another consideration is time spent. Cardiac MRI takes less time per patient than nuclear stress testing, Biederman says. “It’s about 45 minutes for a total study. A nuclear stress test takes about four hours, but facilities can stack up patients. If you have two scanners, you have them run simultaneously, whereas MR is done in real time.” At his center, a busy day involves six cardiac MR studies, where facilities that do stress testing can do 20 patients per day. The economics of scanning more patients factors into which modality is favored, Biederman says. Dorbala confirms this, adding that most centers can perform and interpret about 20 nuclear studies each day without being overly busy. With cardiac PET, using short-acting radiotracers and newer vasodilator stress agents, centers can complete a rest and stress perfusion study in as little as 20 to 25 minutes, she says. Dorbala believes that nuclear stress imaging is the gold standard for myocardial perfusion imaging and will remain so for the foreseeable future. She believes that the evidence on nuclear stress testing’s efficacy is strong, its availability wide, and “so many people are able to offer it and do it well that it’s not going anywhere anytime soon.” Other technologies are improving and catching up, she says, but nuclear stress testing is here to stay. He also says that as health care reform requires providers to improve quality and decrease costs and as payment models evolve, physicians will determine the most appropriate testing modalities. Physicians joining together with hospitals to be part of accountable care organizations and/or clinical integration networks will determine which tests have higher diagnostic accuracy and provide the best clinical outcome, he says. Ultimately that’s what will drive the choice of modality for MPI.